It’s been a year of looking back, literally and figuratively, while writing my memoir and going through all of the supporting materials that come in handy for double-checking dates, locales, and past states of mind. So grateful to those who talked me off the ledges as I wrote, and those who climbed up on the ledges with me as I lived it in the first place. 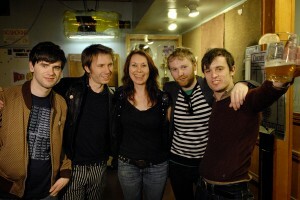 I found this while updating my site today, from my Hanging with Franz Ferdinand piece, archived here amidst the journalism, taken just before I returned them late for soundcheck because one of the lads was in search of a brown corduroy suit at an Allston thrift shop.